Federal set about making a deer specific line in the Fusion cartridge line. They added a quintessential deer cartridge in the .30-30, a brush gun caliber that has arguable killed more deer than most other mainstream cartridge in a history vs. history comparison between calibers. Does that make it the ultimate deer cartridge? Well, it certainly has some dog in the fight. But you can debate the finer points of the caliber argument. 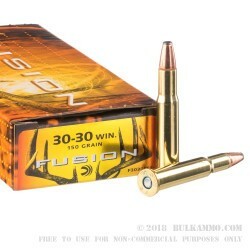 What is clear with the fusion line .30-30 ammunition is that it is a 150 grain, high weight retention, relatively hot load that offers a soft point projectile and a Boxer primed Brass casing. It also delivers performance that is right directly in the sweet spot for deer hunting. 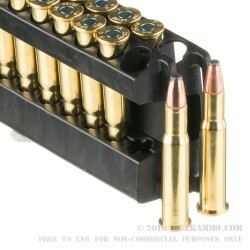 The .30-30 is a rolling, steady deer cartridge that offers enough stopping power, without being ridiculous. It has been a mainstay in the frontier lifestyle for more than a century. The capabilities of the round are essentially limitless given the right hardware, the right load and the right conditions. 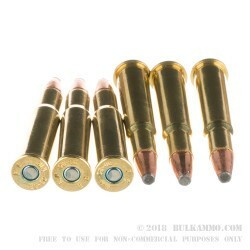 As for the Federal Premium Fusion 150 grain .30-30 cartridge is it a cartridge that delivers 2390 feet per second velocity at the muzzle and 1900 ft. lbs. of energy to sufficiently dispatch moderate and large game and offers a nearly perfect set of ballistics for deer sized animals. Out of a lever gun this round will become a modern day deer classic, to match the historical tradition of the .30-30 it represents.